Peaches are abundant now. My husband’s favorite fruit is the peach. I thought it would be a special treat to create a peach featured lunch for my him. He said it tasted as good as it looked. Peach Salad: I loosely followed this Peach Salad with Tomatoes Feta and Basil Vinaigrette. I forgot to add the feta. I omitted the shallot, and used wine vinegar instead of the sherry vinegar. Peach Muffins: Peach Oatmeal Muffins (from Scaling Back) Since I used these muffins as a main course, I reduced the sugar to 1/8 cup in the topping and to 1/4 cup in the muffin. My husband said that next time I should add a little more sugar. 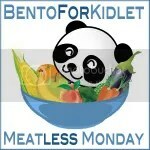 This entry was posted in Bento / Cute Food, Food and tagged bento, featured ingredient, lunch, vegetarian. Bookmark the permalink. 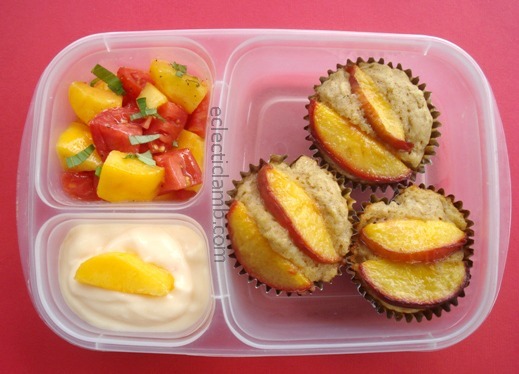 The peach muffin looks delish and I love the way you made it, the salad is mouth watering! Thank you so much Rina! I was happy with how this one turned out. That lunch looks just peachy! How did the peach taste with the tomato? Thank you so much! We actually liked the combination. Wow I have not tried making peach muffins, these look amazing. And I the colours in the peach salad! Summer in a bento box! Those peach muffins look delicious!